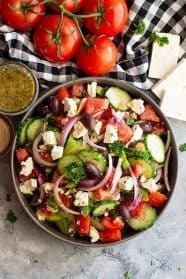 This Easy Greek Salad is perfect for those looking for something healthy to eat other than spinach or kale!! 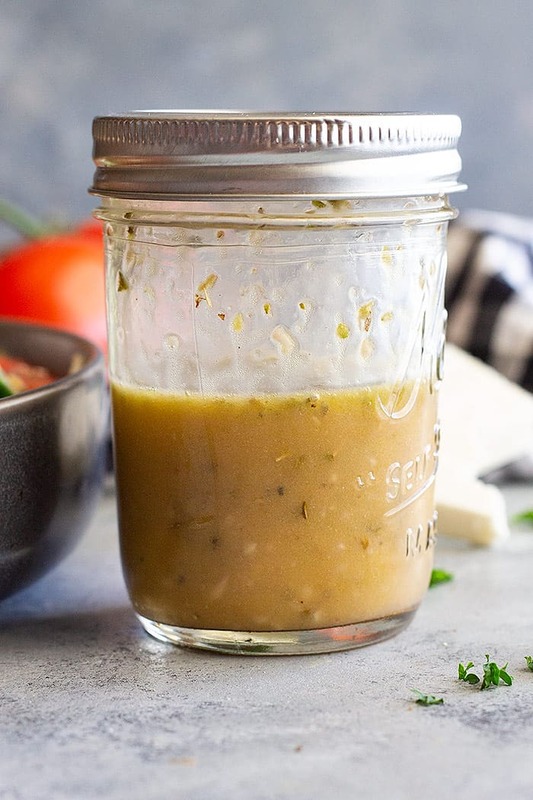 It has a quick and easy homemade dressing and can easily be paired with cooked chicken or seafood! I know I can get tired of eating greens day after day so I am always looking for ways to get some healthy veggies in without the greens. 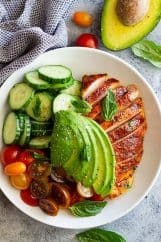 Salads like this Grilled Corn Salad with Tomato and Avocado, Chicken Avocado and Tomato Salad are some of my go to’s and if you do like your greens try this Tuscan Tuna Salad. This salad is a great salad to enjoy year round. However, it doesn’t hold up well so don’t make this too far in advance of when you plan to serve. I would say no more than 2 hours. Because the tomatoes and cucumbers give off too much liquid and the salad starts to get a little soggy. Personally, I will still eat the leftovers the next day but I’m also not that picky when it comes to food. 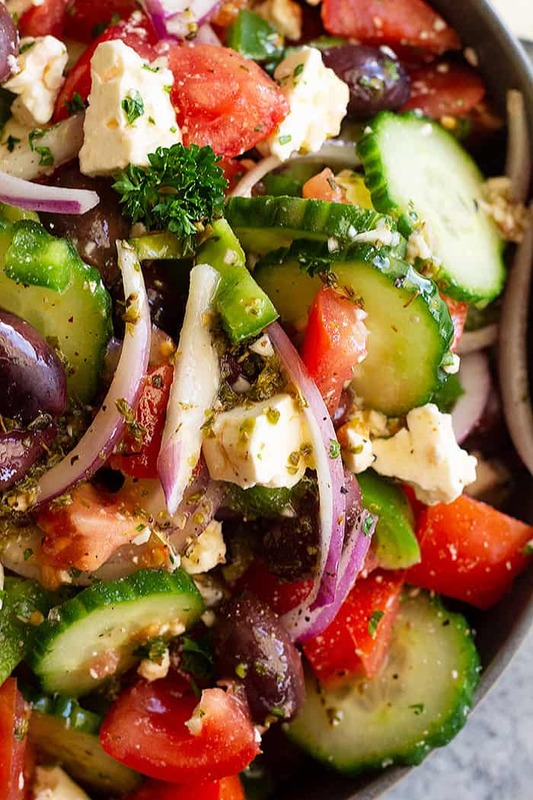 Traditional Greek salad Ingredients ALWAYS include tomato, cucumber, red onion, green bell pepper, kalamata olives, feta cheese, dried oregano, red wine vinegar, and good extra virgin olive oil. I have added a few extra ingredients because that’s just how I roll. I added fresh parsley, minced garlic, and Dijon mustard because I like the flavor it adds. Feel free to leave them out if you want to stay traditional. Tomatoes: Use the ripest you can find for best quality. Cut into large chunks or even wedges to keep this salad traditional. Cucumbers: English cucumbers work great in this salad and is preferred over regular cucumbers. However, if that’s all you can find be sure to peel them and remove the seeds if the seeds are large. Red Onion: The only onion you should ever use in fresh salads, period. Green Bell Pepper: For this to be traditional only green is used but I won’t tell if you use red, orange or yellow! Kalamata Olives: Try to find the best quality you can. Look for dark almost black olives. If you have access to an olive bar there are usually pretty good olives there. Feta Cheese: If you can find a block of feta that is ideal. That way you can break it into larger chunks. Or if you want to be completely traditional cut it into wedges instead. Extra Virgin Olive Oil: Good quality is a must here because it’s the base for the dressing. Red Wine Vinegar: This adds a lot of flavor and a slight tang to the salad. Dried Oregano: Most of the time just sprinkled on the salad but I added it to the dressing instead. 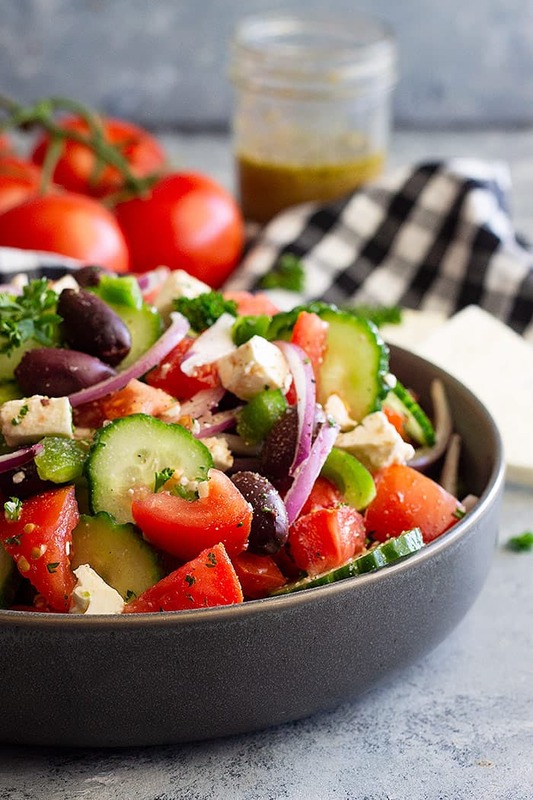 WHAT KIND OF CHEESE IS USED IN GREEK SALAD? Feta Cheese is the traditional choice! When you purchase the cheese at the store it’s sold in packages as crumbles or a chunk. I always choose the “chunk” version, you can crumble it yourself and it’s more affordable. The crumbles dry out faster too – chunk is the way to go! 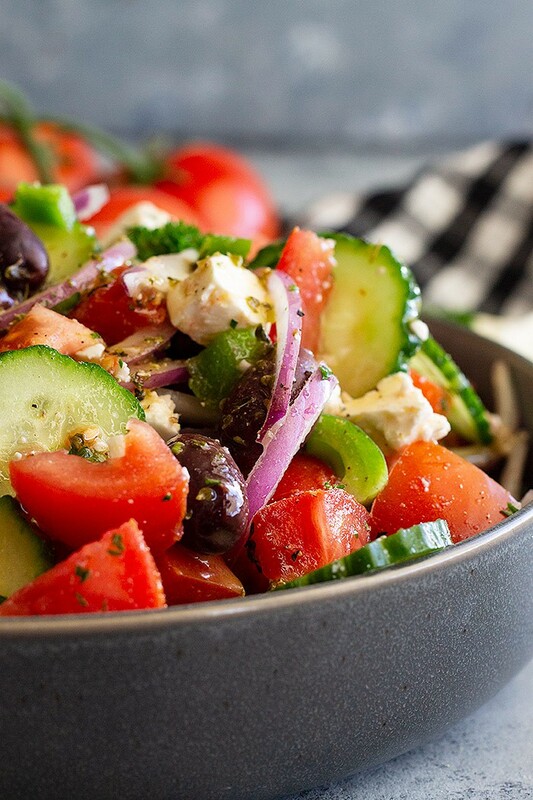 What to serve with Easy Greek Salad? Any cooked chicken would be great. 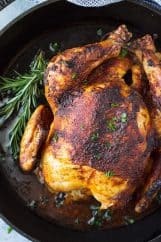 Like this Homemade Oven Roasted Rotisserie Chicken. Any cooked seafood. 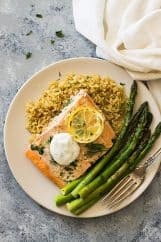 I personally love this with a simple cooked salmon (made with a little salt, pepper, and fresh lemon). In a small jar combine all ingredients for the dressing and shake well, set aside. In a large bowl combine all salad ingredients and gently toss. Drizzle with dressing. Serve immediately. If you can find a block of feta and crumble it into larger chunks that is best. But if all you can find is crumbled feta that will work too. This salad is best served right away in my opinion. But I still enjoy the leftovers! Nutrition info- Since different brands of ingredients have different nutritional information, the information shown is just an estimate. 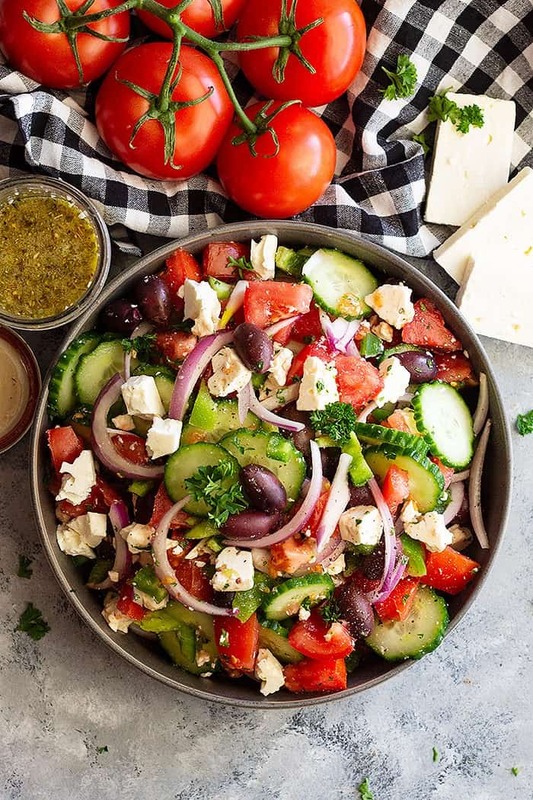 Great tips on how and what to shop for with this salad! 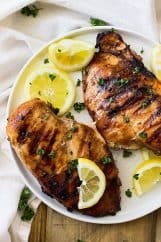 I’m going to make it with the chicken, sounds delicious!